Q4 EPS of $0.81 vs. estimates of $0.82 that’s a miss. Revenue of $10.6 billion vs. estimates of $10.47 billion. That’s a beat. The stock is up just a tad in after hours trading. REDWOOD SHORES, CA — (Marketwired) — 06/16/16 — Oracle Corporation (NYSE: ORCL) today announced fiscal 2016 Q4 results. Total Q4 Revenues were $10.6 billion, down 1% in U.S. dollars and flat in constant currency. Cloud plus On-Premise Software Revenues were$8.4 billion, flat in U.S. dollars and up 2% in constant currency. Cloud software as a service (SaaS) and platform as a service (PaaS) revenues were $690 million, up 66% in U.S. dollars and up 68% in constant currency. Total Cloud revenues, including infrastructure as a service (IaaS), were $859 million, up 49% in U.S. dollars and up 51% in constant currency. Operating Income was $4.0 billion, and Operating Margin was 37%. Non-GAAP Operating Income was $4.8 billion, and the non-GAAP Operating Margin was 45%. Net Income was$2.8 billion while non-GAAP Net Income was $3.4 billion. Earnings Per Share was $0.66, while non-GAAP Earnings Per Share was $0.81. 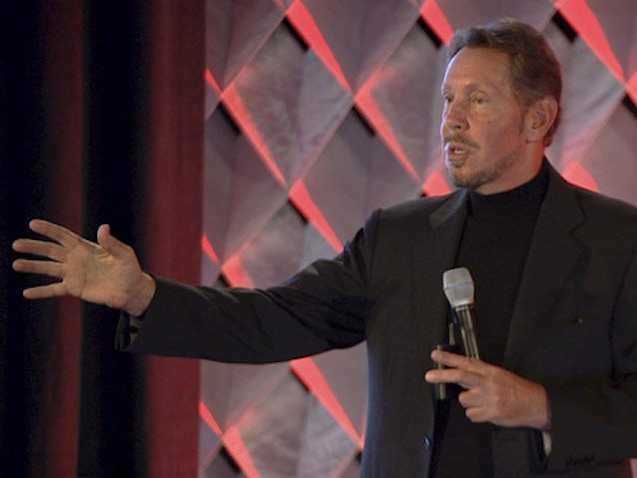 Without the impact of the U.S. dollar strengthening compared to foreign currencies, Oracle’s reported GAAP Earnings Per Share would have been 2 cents higher and non-GAAP Earnings Per Share would have been 1 cent higher. Short-term deferred revenues were $7.7 billion, up 6% in U.S. dollars and up 7% in constant currency compared with a year ago. Operating cash flow on a trailing twelve-month basis was $13.6 billion. For fiscal 2016, Total Revenues were $37.0 billion, down 3% in U.S. dollars and up 2% in constant currency. Cloud plus On-Premise Software Revenues were $29.0 billion, down 2% in U.S. dollars and up 3% in constant currency. Cloud SaaS and PaaS revenues were $2.2 billion, up 49% in U.S. dollars and up 52% in constant currency. Total Cloud revenues, including IaaS, were $2.9 billion, up 36% in U.S. dollars and up 40% in constant currency. Operating Income was $12.6 billion, and Operating Margin was 34%. Non-GAAP Operating Income was $15.8 billion and non-GAAP Operating Margin was 43%. Net Income was $8.9 billion while non-GAAP Net Income was $11.2 billion. Earnings Per Share was $2.07, while Non-GAAP Earnings Per Share was $2.61. Without the impact of the U.S. dollar strengthening compared to foreign currencies, Oracle’s reported GAAP and non-GAAP Earnings Per Share would have been 17 cents higher. The Board of Directors also declared a quarterly cash dividend of $0.15 per share of outstanding common stock. This dividend will be paid to stockholders of record as of the close of business on July 6, 2016, with a payment date of July 27, 2016.